Materialized views, a rdbms silver bullet, demonstrate its efficacy in many applications, especially as a data warehousing/decison support system tool. The pivot of playing materialized views efficiently is view selection. Though studied for over thirty years in rdbms, the selection is hard to make in the context of xml databases, where both the semi-structured data and the expressiveness of xml query languages add challenges to the view selection problem. We start our discussion on producing minimal xml views (in terms of size) as candidates for a given workload (a query set). To facilitate intuitionistic view selection, we present a view graph (called vcube) to structurally maintain all generated views. By basing our selection on vcube for materialization, we propose two view selection strategies, targeting at space-optimized and space-time tradeoff, respectively. We built our implementation on top of Berkeley DB XML, demonstrating that significant performance improvement could be obtained using our proposed approaches. Tang, N, Yu, J.X, Tang, H, Tamer Özsu, M, & Boncz, P.A. (2009). Materialized View Selection in XML Databases. 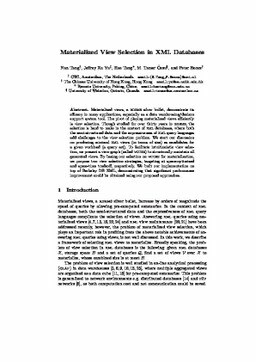 In X Zhou, H Yokota, K Deng, & Q Liu (Eds.), . Springer.